​ Any farmer can tell you the sun is crucial for growing crops, but few can claim to harvest the sun itself. 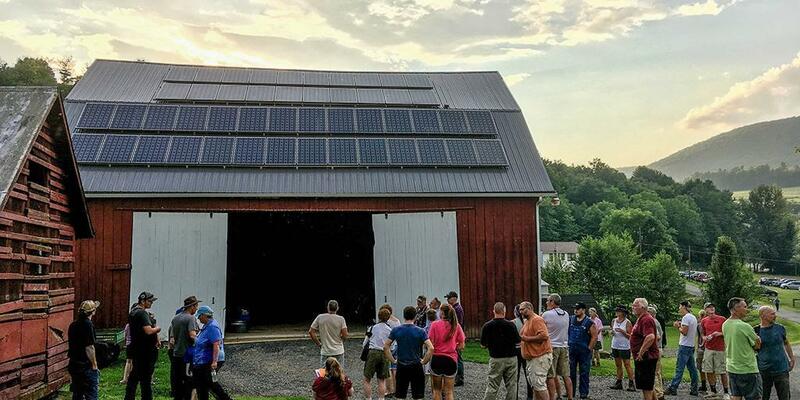 The Barbour Family Farm​ in Lycoming County is doing just that, with operators Ted and Tracey Barbour using solar panels on the roof of their 100-year-old barn to get clean power and bolster the bottom line of their small beef cattle operation. Members of the public, staff from DEP’s North-central Regional Office, and representatives from community organizations viewed the solar panels during a recent visit to the farm. The tour was part of DEP Connects, a new program inviting the public to engage with DEP in their communities through events hosted by the department’s six regional offices. The farm has a source of clean, renewable energy for use on the property. When the solar panels produce more energy than the farm can use, the Barbours sell electricity back into the power grid. Generating renewable energy credits provides a supplemental income source of about $300 per month for the farm. The family recouped their initial investment in just over four years. “The total cost was $53,000, including some necessary electrical upgrading; but after a rebate from the PA Sunshine Program and a 30 percent federal tax credit, the final out-of-pocket cost was $20,000,” he said. Barbour determined that a roof-mounted solar array was more efficient and cost-effective than a ground-mounted array, which would remove the area from future grazing and require lawn care and fencing to keep cattle out. He had a new roof put on the barn at a cost of $20,000 prior to installation of the solar panels because he views them as a lifetime investment and wanted to ensure they wouldn’t outlive the old barn roof. Barbour encourages other farmers who are considering going solar to keep three guidelines in mind: Do your homework, get multiple quotes, and consider it a major capital investment. Guests toured the farm’s other conservation practices as well and learned how they have improved soil and water quality, wildlife habitat, and cattle health. “The Barbour Farm is a great example of taking voluntary, incremental, achievable steps that we hope others will emulate,” said DEP North-central Regional Director Marcus Kohl. “These best management practices add up to create monumental change in the landscape. “The Barbours show how even our small and medium-sized family farms can access a variety of resources to increase their environmental and economic sustainability, supporting the farm operation’s viability for future generations,” added Kohl. The Barbour Family Farm was recognized by the Lycoming County Conservation District in 2013 as their “Cooperator of the Year” for their environmental stewardship efforts. Visit DEP’s website to read Frequently Asked Questions about solar electricity, learn more about solar for homes and businesses​, and find out how DEP is working to find Pennsylvania’s Solar Future​.